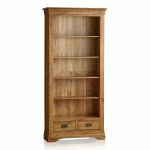 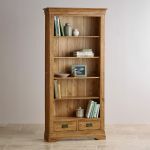 The French Farmhouse Rustic Solid Oak Tall Bookcase boasts a refined styling which is reminiscent of classic French furniture, particularly of the Louis Philippe period. Made using one hundred percent premium grade solid oak and featuring the signature panels, inlaid grooves and flared cornices of our French Farmhouse range, it's another masterstroke of quality craftsmanship. 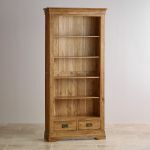 With five generously-sized shelves the bookcase offers plenty of space to display your books, magazines and ornaments. 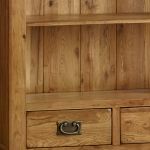 For other storage options, there are two spacious drawers at the base - both made to meet our exacting standards of quality; which means resilient dovetail joints and solid oak backs, bases and runners come as standard. 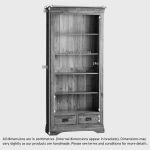 Finishing touches include antiqued drop bar handles, an arched base and softly rounded edges on the drawers. 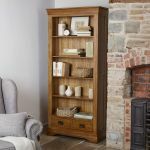 For perfectly matching pieces, take a look at the rest of the French Farmhouse range - you won't be disappointed.